First person autobiographical insights interest me since they provide examples of what shapes their path to the top. My fascination with these accounts, and my own experience as an Olympic coach (1988, 1992) and Open University academic, led me to research 25 autobiographies from serial champions. Amongst these were a number of teenage champions. The youngest medallist at the Commonwealth Games was 13 year old para-swimmer Erraid Davies and the whole event narrative was dominated by young, up-and-coming athletes, many in their teenage years. Likewise the new Premiership season will no doubt see new 18-year-old, or younger, talents emerge. Child champions’ breakthroughs are fascinating as they have no medal success at the top level to help build supreme optimism to succeed. They often defy the form books to breakthrough to senior success while still at school. Take Cathy Freeman who, aged 16, won a relay 100m gold medal at the 1990 Commonwealth Games. ‘[She] spent the first few days [in the athlete’s village] with [her] mouth open, staring at everyone and everything.’ Problems with dropped batons in practice meant self-doubt began to gnaw away. But confidence to succeed has a social element. What others say and their behaviour around us matters. If others believe in you and make this abundantly clear, it is a real fillip. In this case it came in the form of the team’s top sprinter, Kerry Johnson, who had been Freeman’s number one supporter and looked out for the ‘baby of the team’. Johnson threatened the management that she would boycott the team unless Freeman ran. Her pre-race advice to Freeman, ‘I think we’ll win this today,’ arguably helped convince the schoolgirl that she deserved to be there. They surged to gold and Freeman’s life changed in that moment. Likewise, the other person that helped instil self-belief in 15-year-old Michael Phelps was his coach, who ignited his desire to become the youngest ever swimming world record holder. But natural hormonal support was also at play. In the preceding year Phelps experienced his most accelerated growth spurt – a two-inch height gain on the marks on his doorway at home. His coach lit the fuse by writing ‘WR Austin’ (World Record, Austin, Texas) on all the notes he left for Phelps over six months preparing to break the 200m butterfly world record. At the Austin meet he was the first ever to swim under 1 minute 55 seconds. At the 2012 Olympics a shocked 15-year-old Lithuanian swimmer, Ruta Meilutyte, emerged from the pool astonished and in tears at winning gold. Appropriately, it was Ian Thorpe who defended and rationalised her teenage success to a suspicious media. Not being scared sums it up nicely – the benefit of being a child. As he reminds us, life gets more complicated as an adult – relationships, mortgages, media commitments, expectations, elevated pressure, the weight of history and other athletes gunning to beat you. Child champions’ unique experience are all part of the complex mix that contribute to examining what shapes champions’ paths. My research and writing Podium has also been a real journey that often challenged my own beliefs. 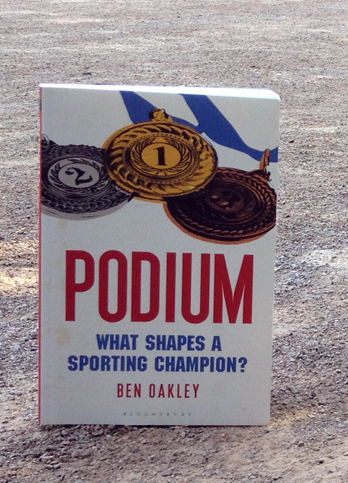 This entry was posted in Books, Coaching, Commonwealth Games and tagged Ben Oakley, Commonwealth games, Podium, sports champions. Bookmark the permalink.